In first pAsuram – AzhwAr explains the essence of this decad saying ” all those who become attracted towards emperumAn‘s beauty and qualities and serve him, whoever they may be, they are my masters”. 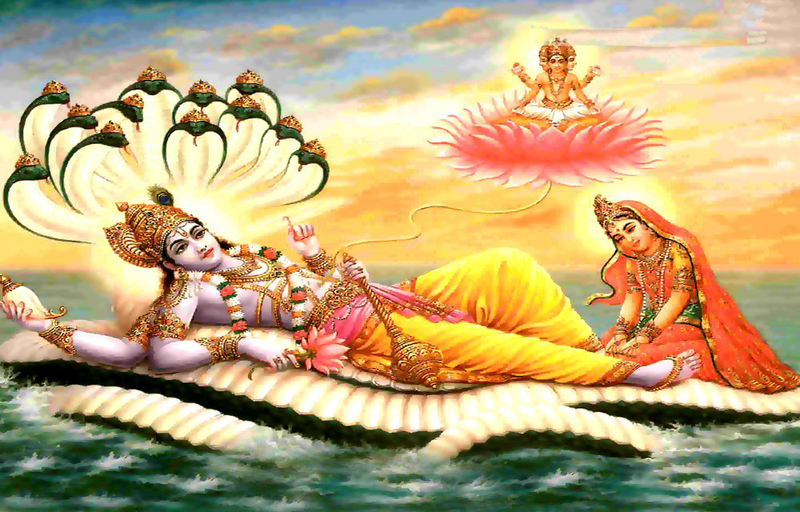 In first pAsuram – AzhwAr says “bhAgavathas who have the wealth of associating with the lord of all, who is resting in milk ocean with distinguished form and qualities, even if they are considered inferior due to their birth, actions etc., they are my masters”. emperumAn is one who is having abundant radiant divine form which is an embodiment of splendour, having lotus-eyes which indicate supremacy, having supremacy in the enjoyable nature of form and qualities, mercifully rests in the divine milk ocean being perfectly enjoyable for his devotees who are fully engaged (in this beauty); those who have the wealth of being together with him to be eternally engaged in him, even if they lack (high birth, knowledge, actions), even in that same state, they are the supreme masters having us as servitors in many births. It is implied that their [bhAgavathas] enjoying his [bhagavAn‘s] supremacy is the reason for their supremacy. payilum – payilugai – seRigai (growing abundantly); since it is in present continuous tense, it will constantly be glowing unlike in worldly aspects where the radiance may grow for some time only to be reduced eventually since they are driven by karma [here, payilum is explained as adjective for the radiance]. sudar oLi mUrththiyai – one who is having a form is which is embodiment of perfect splendour. payilum sudar – Alternatively, payilum is explained as nithyathva (eternal) – that is the radiance existing eternally at all times. sudar oLi mUrththiyai – sudar and oLi implies thEjas (splendour) – great splendour. Alternatively – oLi means beauty [sudar oLi – shining beauty]. One who is having divine form which is embodiment of pure goodness revealing his true nature. His divine form is of pure goodness such that it reveals his auspicious qualities such as gyAnam etc and his true nature as said in SrI bhagavath gIthA 14.6 “thathra sathvam nirmalathvAth prakASakam” (that sathva guNam (goodness) which reveals the purity), SrIvishNu purANam 1.9.63 “thEjasAm rASimUrjitham” (one who shines like collection of radiant rays and who has the valour to demolish his enemies), SrI bhagavath gIthA 11.12 “dhivisUrya sahasrasya” (Like a thousand sun shining at the same time in the sky) being perfectly radiant and captivating as said in “shAdguNya vigraham” (divine form with six qualities) for those who want to be captivated. pangayak kaNNanai – All his bodily beauty will be matched with the beauty of his eyes. This is explained in SrI rAmAyaNam sundhara kANdam 53.8 “rAma: kamalapathrAksha:” (SrI rAma, having eyes that resemble lotus petal). Those who are attracted towards his bodily beauty, would be kept captivated by the beauty of his eyes. His bodily beauty is like a radiant ocean. The beauty of his eyes resembles well spread lotus flower in that radiant ocean. His physical beauty itself attracts everyone. Moreover his eyes would reveal his internal qualities such as motherly affection etc. payilum … – [from the beginning] One who is having eternal perfectly radiant form and more beautiful eyes. payila iniya – Due to his ever lasting physical beauty and beautiful eyes, he is enjoyable. Other [worldly] matters are of the nature that – they look nice from a distance [or before attaining], but once approached closely [or attained], one would want to leave them [since they don’t look the same beautiful way in all aspects]; when emperumAn is approached closely, we will understand the defects of worldly aspects; at the same time [when emperumAn is approached closely], we will understand the nature of emperumAn being the eternal goal. This is why emperumAn is the nithya prApyam (eternal goal). Once bhagavAn‘s beauty is enjoyed, even subsequently, the experience will be afresh as said in chAndhOgya upanishath 8.12.3 “nOpajanam smaran” (AthmA will not contemplate about the material body after reaching the spiritual realm), like a liberated person will forget about his worldly existence [eternally enjoyable means even if we repeatedly enjoy emperumAn, there will never be boredom and there will always be a new type of experience every time forever]. As explained in periya thirumozhi 8.1.9 “paNdu ivarai …” [Have I seen thirukkaNNapuram emperumAn before somewhere else?” wonders parakAla nAyaki, says her mother] – When meeting emperumAn the first time, due to natural lordship and the coolness/mercy in the face, even though one may not have seen him before, one would wonder “He looks familiar; have I seen him before?”; but even after getting to know each other for a few days, one will wonder “Have I seen him before [He looks different now]”. I (nampiLLai) asked [nanjIyar] – As the words “paNdu ivarai yAm kaNdu” are the same – why is there two different meanings in two different situations? nanjIyar replied to me saying – In both situations (initial and subsequent), the same word “payilginRALAl” (repeatedly reciting) is used [so one way or other, parakAla nAyaki is always wondering about the identity of emperumAn]. nam … – Can he be ignored due to lack of good qualities though he is very beautiful? No. The one who has “kalangAp perunagaram” (unshakeable big city – paramapadham) as his abode, descends to the milk ocean to address his devotees [out of great compassion – so, he is filled with auspicious qualities too]. nam – implies “for his devotees”. Others, who are beautiful, when desired to be approached, will make it difficult to do so [out of pride etc]; but such beautiful emperumAn himself descended to milk ocean which is nearer [for us] in comparison to paramapadham to be enjoyed by his devotees. paramanai – You extolled his physical beauty and qualities over others; is there any one as great as he? No. There is no one superior to him [He is the most supreme lord]. paramanaip payilum thiru udaiyAr – Considering his presence to be a good opportunity, instead of begging for worldly favours, those who approach him having the wealth of considering himself as the goal. Those who approach him for specific ulterior goals, will leave him after their goal is accomplished; but those who approach him considering him as the goal, will get closer and closer. thiru – Like he has the crown of supremacy, these devotees have the crown of servitude; [three personalities/incidents are cited to explain to thiru/SrI/wealth] As said in SrI rAmAyaNam yudhdha kANdam 16.17 “anthariksha gathas SrImAn” (SrI vibhIshaNAzhwAn, the most wealthy person who has started his airborne journey towards SrI rAma); vishNu dharmam 68th chapter “sathu nAgavaraS SrImAn” (that gajEndhrAzhwAn is endowed with wealth of kainkaryam); SrI rAmAyaNam bAla kANdam 1.18.29 “lakshmaNO lakshmI sampanna:” (lakshmaNa who is endowed with kainkarya SrI); [explaining each personality in detail now] “anthariksha gathas SrImAn” – As soon as took one step considering SrI rAma’s lotus feet as the goal, giving up lankA, his poverty of being associated with rAvaNa got eradicated and real wealth matching his true nature was acquired. “sathu nAgavaraS SrImAn” – Here SrI gajEndhrAzhwAn’s great desire to serve emperumAn which made the sarvESvaran arrive hurriedly without checking his personal looks etc., is explained as the wealth; “lakshmaNO lakshmI sampanna:” – lakshmaNa’s servitude was such that, even when perumAL (SrI rAma) forced him to accept the throne of the prince and was told as in SrI rAmAyaNam yudhdha kANdam 131.88 “sarvAthmanA paryanunIyamAna:” (Only if you became a prince, I will become the emperor), lakshmaNa simply rejected any post and remained as a servitor only. When bharathAzhwAn was asked “when will you be relieved of internal agony?”, he replied as in SrI rAmAyaNam ayOdhyA kANdam 98.8 “yAvanna charaNau bhrAthu: pArthivavyanjanAnvidhau SirasA dhArayishyAmi…” (Until I behold the divine feet of my brother SrI rAma who has all qualities of being a king, I will not have peace), “When perumAL is crowned with suitable throne for him [being the lord], and I being crowned with suitable throne for me [being the servitor], my distress will be removed”. This is explained in perumAL thirumozhi 10.7 “arasamarndhAn adi sUdum arasu” (the crown of the lotus feet of SrI rAma being the emperor). kulaSEkarAzhwAr desires to be living at the divine feet of emperumAn. udaiyAr – As seen in “vaiSravaNan” (who is the son of vichiravasu), those who have the wealth of pArathanthriyam (total subservience), are known as udaiyAr [in thamizh, udaiyAr means those who possess/have]. What other glories should they have to be praised/supported by us? yavarElum – Whatever may be their birth, actions and knowledge; such subservience only is required. avar kaNdIr – Since the pride which is acquired through high birth, best actions and great knowledge are hurdles for one’s servitude towards bhagavAn, AzhwAr says “those who are devoid of such pride” are desired. AzhwAr says “those want to identify themselves as ‘thadhIyar’ (bhagavAn’s devotee) only, and those who are devoid of the pride of high birth etc., which are contrary to vaishNavathvam (the quality of being a vaishNava) are my favourites”. payilum piRappidai thOru – In all births which occur one after another. Now, AzhwAr is desiring for the same births which he wanted to give up previously in thiruvAimozhi 3.2.2 “nin pal mA mAyap pal piRaviyil padiginRa yAn” (me who is suffering in many different births which is facilitated by your amazing abilities), since those births are used to serve bhAgavathas. AzhwAr says that he is ready to take many more births if he will be serving at the divine feet of a bhAgavatha (devotee). emmai ALum paramar – The lords who can enslave me. When asked “previously you said emperumAn is ‘paraman’ (supreme) and now you are seeing his devotees are ‘paramar’; why is it like this?”, AzhwAr says “There, he was glorified due to his great qualities; here, those who are captivated by his such great qualities are glorified”. If individuals are glorified independently without their relationship with bhagavAn, that means AzhwAr’s relationship with bhagavAn will become void. This entry was posted in thiruvAimozhi, thiruvAimozhi 3rd centum on September 27, 2016 by Sarathy Thothathri.